Famous for her beauty, Heather Morris Rocks Sky High Ponytail hairstyles both off and on the screen. Known as the sky high ponytail, the hairstyle instantly show off beautiful bone structures and other gorgeous facial features. Many celebrity hair and make-up artists have known about the high ponytail secret forever. A sky high pony will showcase well-defined eyebrows, beautiful eyes, stunning cheeks, an elegant nose or luscious lips. The higher the base of the ponytail on the head, the sexier and more youthful the line. Even better, a sky high ponytail is easy to construct and can be created on the majority of hair types and textures. Note: Check out the Heather Morris Hairstyle Gallery at Hairboutique.com. 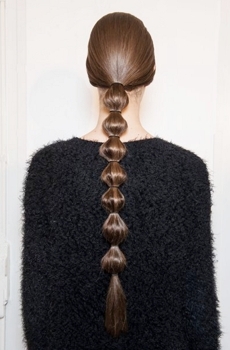 If your own hair isn’t long enough for a pony, you can easily pop on a clip-on pony. This is a dizzying array of add-on ponytail options. What defines a high pony? A true sky hair ponytail should rest either right at the crown or slightly above it. Since hair bumps may be desirable to some, optionally you may wish to add a hint of a bump from the hairline towards the base of the ponytail. The best way to secure the tightest of high ponytails is to secure them with hook based hair bungee cords. Bungees provide the option to double or triple wrap the pony’s base. Gorgeous actress Heather Morris played ditzy blonde cheerleader Brittany on Fox’s hit show, Glee. She was famous for her sky high ponytails which she wore on and off the screen. She loved wearing high ponytails on the Red Carpet and at other celebrity events. Heather, who emerged as a quiet, but powerful Glee team player, was never meant to have a regular role on the popular Fox show. Originally cast to be a bitchy cheerleader without a story line, Heather became a fan favorite along the way. Heather’s entry into the regular cast occurred when she showcased her spectacular dance skills. Although she didn’t have a story line, she was considered a valuable member of the show’s dance ensemble. The actress trained with some of the very best celebrity tours including touring with Beyonce for two years. Heather brought her knowledge of the choreographer for Bey’s Single White Ladies to the Glee set where her work teaching the rest of the cast to dance caught the eye of Glee creator Ryan Murphy. Sold on her amazing talents, Murphy hired Heather for an ongoing set of storylines. A dancer like Heather knows how great it is to wear a sky high ponytail when she’s performing her craft. The right sky high pony will add movement to a talented performer. One several of the Glee episodes where Heather was featured dancing, her hair was worn up in her trademark sky high ponytail. It added an element of grace and elegance to her performances. Although Heather has been known to wear her ponytails perched at the highest point on top of her head, she appeared on the Red Carpet and at an array of Hollywood awards shows with her hair coiffed in an array of ponytails which were positioned below her crown. The beauty of sky high ponytails is that they never really are too high. Ultimately every ponytail wearer should experiment with the positioning of their ponytails when striving to achieve a sky high ponytail style. This entry was posted on Tuesday, April 13th, 2010 at 10:48 pm	and is filed under Celebrity Bites, Celebrity News, Celebrity News & Juice, Hair, Hairstyles, Hairstyling Tips, Long Hair, Music Scene, News, TV's Picks & Pans, Women's Hairstyles. You can follow any responses to this entry through the RSS 2.0 feed. Both comments and pings are currently closed.